Participating in Apartment Therapy's Style Cure has meant choosing a paint colour for our entrance hallway. In the condo, I selected colours based on how neutral they were and how much they opened up the space because we always knew we'd be leaving soon. I've always found choosing colours to be pretty straightforward... Until now. The new/old house is going to be our home for years, and I want to really love it. I thought choosing a colour would be simple, but I'm feeling a bit paralysed when it comes to actually pulling the trigger. 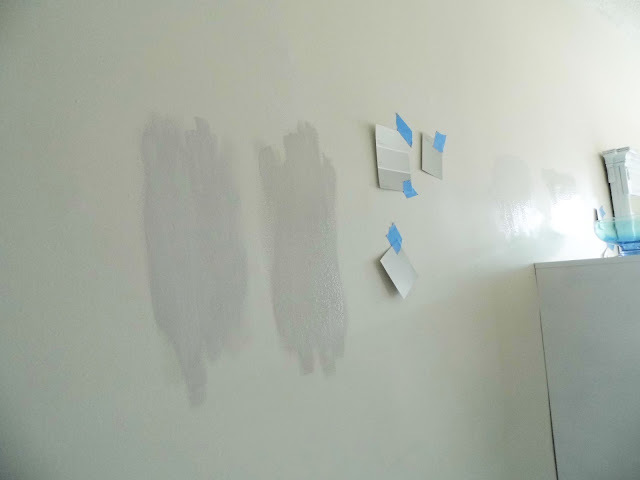 We've been living with these paint swatches on the wall for weeks, and have even been removing a few every couple of days, but I found that the "left over" colours weren't quite what I wanted. Then, someone in the Apartment Therapy community mentioned a great Farrow and Ball colour that seemed like the exact shade of grey that I wanted. 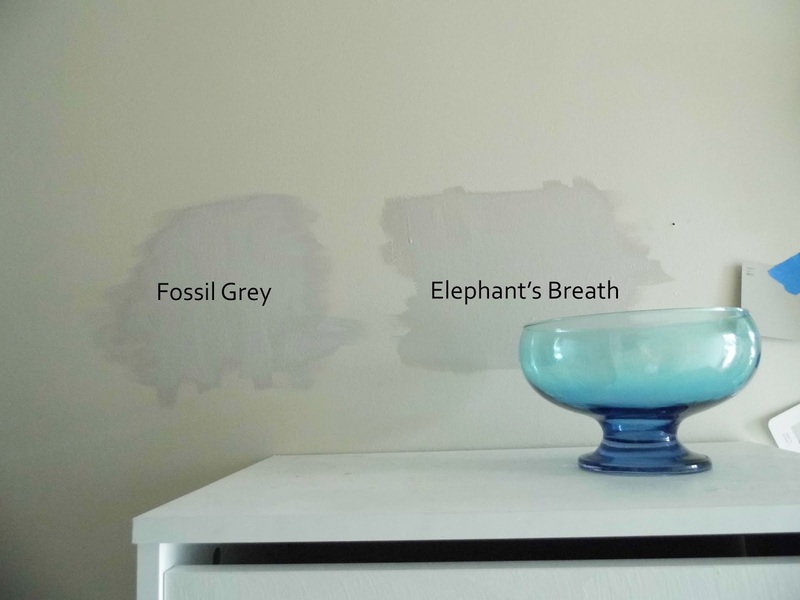 Elephant's Breath by Farrow and Ball is warm and neutral, yet sophisticated... Exactly what I want for our hallway. This is the first time we've ever given real thought to our wall colours and we decided to spend the time to purchase some sample colours so that we could paint larger portions of wall. 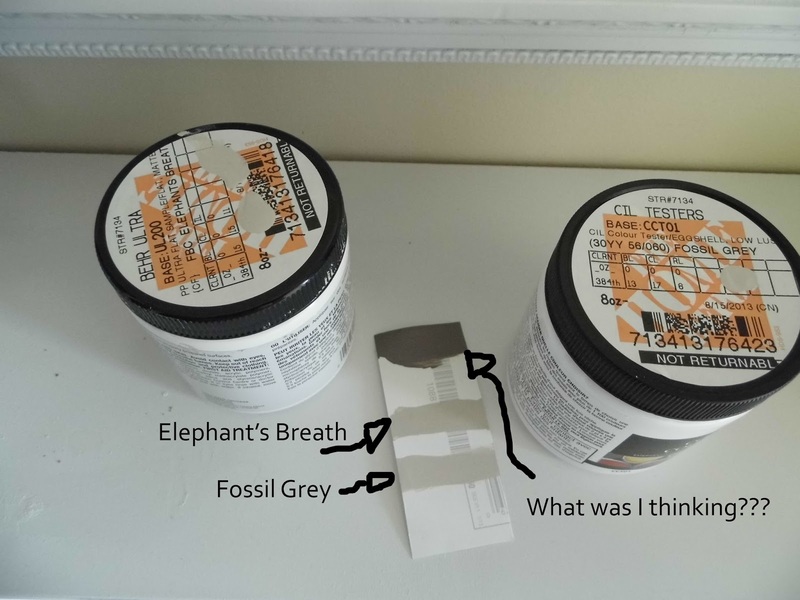 While Farrow and Ball paint may still be a little expensive, we asked for a colour match at Home Depot. They actually had most Farrow and Ball colours in their database already so we settled for samples of Elephant's Breath by Farrow and Ball and Fossil Grey by CIL, which I noticed as I was waiting for them to mix Elephant's breath. I also requested a third sample of a much darker and warmer grey, but I hated it so much that I didn't take the sample home. How funny is it that neither test colour was originally on our wall? 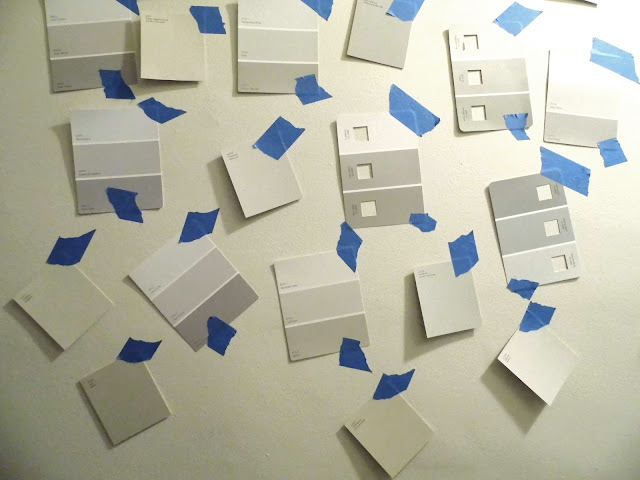 We ended up painting test swatches at several different points in our hallway (both downstairs and upstairs) in order to get a real sense of the shades in different light. 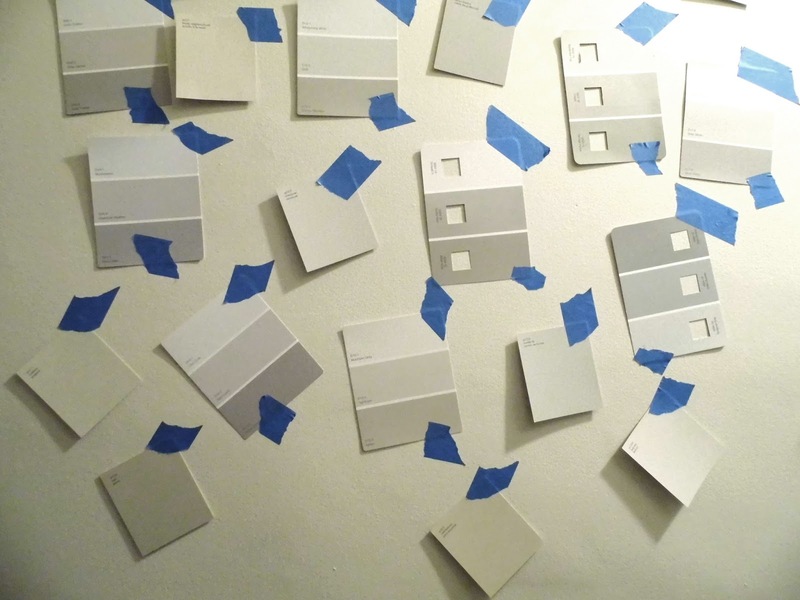 We think we have a clear winner here (I think we will always paint sample swatches from now on.) and we're so excited to finally paint the entire wall! We have a little more patching to do before we get started. What do you think? Can you guess which we prefer? In hindsight, I shouldn't have snapped these photos before the paint had completely dried. You'll see the true colour around the edges of each painted swatch.